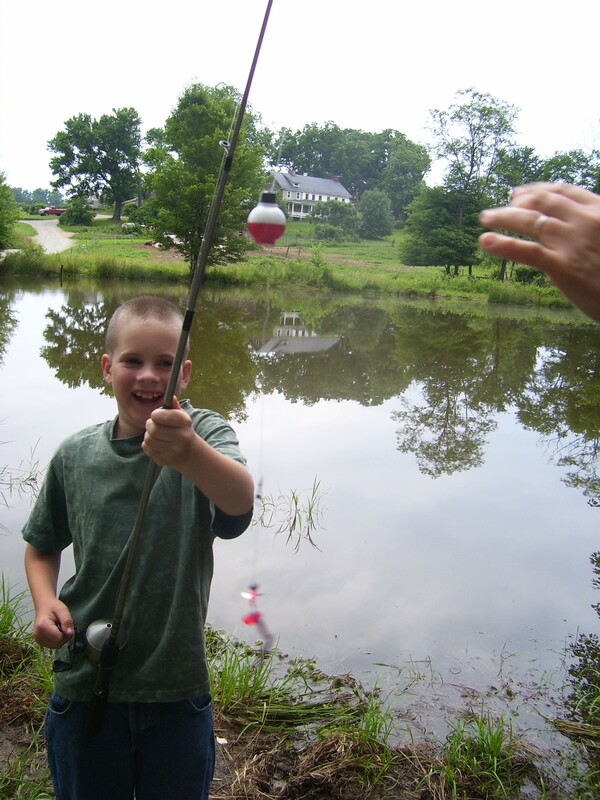 Fishing for Birthday Party Ideas? Birthday parties are something I have definitely gotten more lax about in my parenting years. Sort of, at least. I can still look back at my oldest son’s 1st birthday party and laugh at how “perfect” I wanted things to be. Granted, there weren’t tons of guests, just close family members. He was also just 1, so it wasn’t like he was going to remember any of it. We had a Winnie the Pooh theme and it was most definitely themed out to the max. From the food to the decorations to the Winnie the Pooh ice cream cake I had lovingly made, I wanted it all to be just right. As I have mentioned, I’ve relaxed my standards a bit and figured out that no one cared too much–except me. Also, we have 5 children who all have springtime birthdays, plus mine thrown in, so I have a little rule about Birthday parties now. Each kid got a family party at 1, a friends party at 5, and now another party at 10. 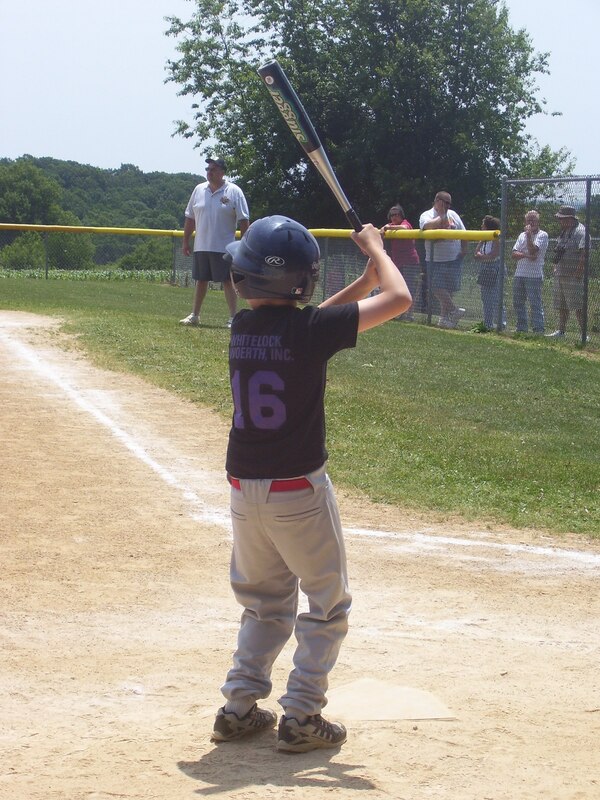 The next one is probably at 16, but thankfully we have a few years to figure that one out. I’ve had all sorts of themes, from Elmo, John Deere, Thomas, and even a Princess Tea Party. The only party we had this year was my oldest son’s 10th birthday bash. 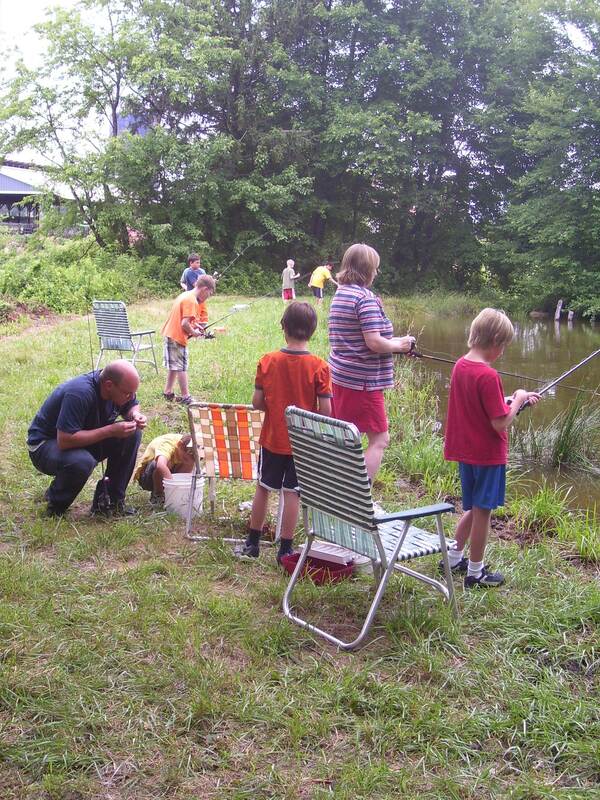 He’s very into the outdoors, so he wanted a fishing party with some of his buddies from school and scouts. Fortunately for us, my in-laws have a dairy farm with a pond surrounded by woods, so we were able to have it there. All of our other parties have pretty much been held at our house and none were really expensive. I have a personal pet peeve about kid bashes that are just over the top and involved way more $ than I would have ever spent on a children’s birthday party. Today I just wanted to share a few of the things we did–it was simple, not overly planned, and fairly cheap to pull off. 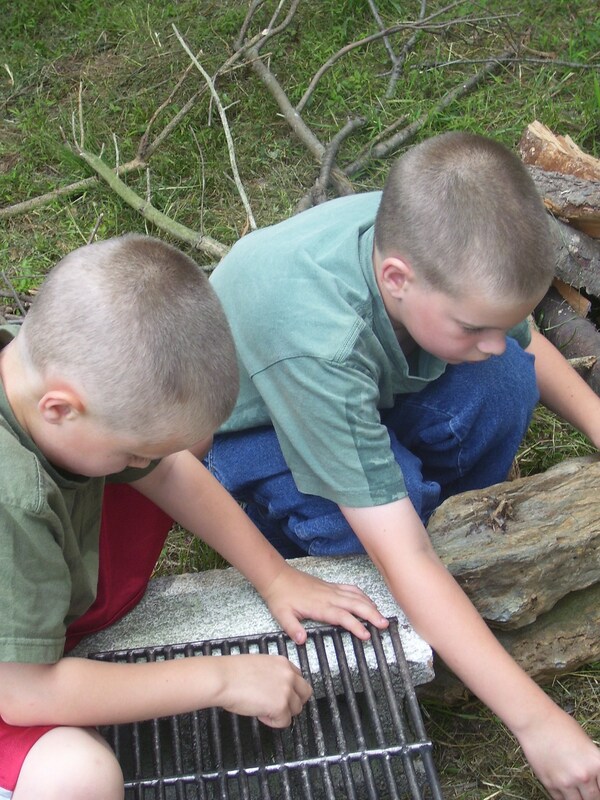 As you can see, the boys all brought their own poles and sevral brought their own tackle boxes, bait, etc. We also had our fishing gear handy for anyone to use. One other Mom and another one of the Dads stayed to help (they are the adults in the picture). 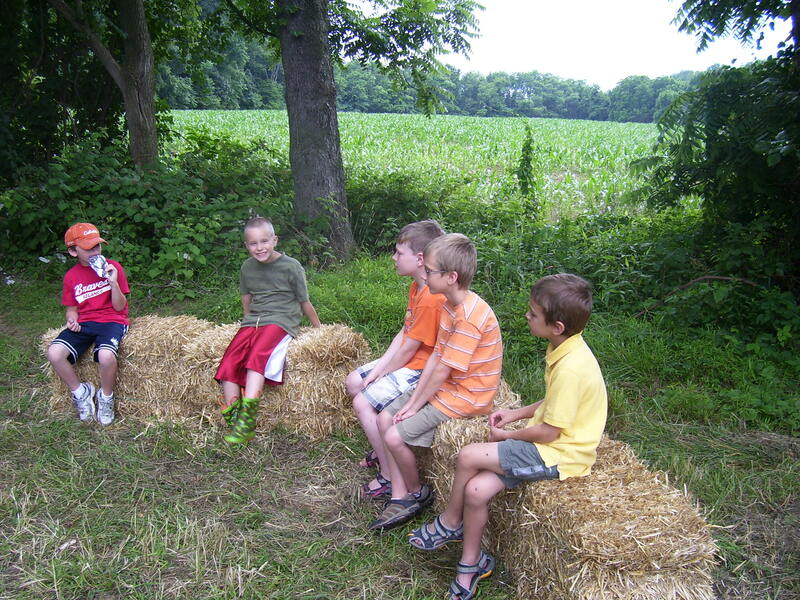 Instead of hauling down lots of tables to the pond, we sat straw bales around for the boys to sit on. Two of my boys working on the fire pit. As far as food, we had a campfire for cooking hot dogs and marshmallows. We also had simple fare to go along with: baked beans cooked in the can on the campfire, chips, watermelon, juice pouches, S’mores. 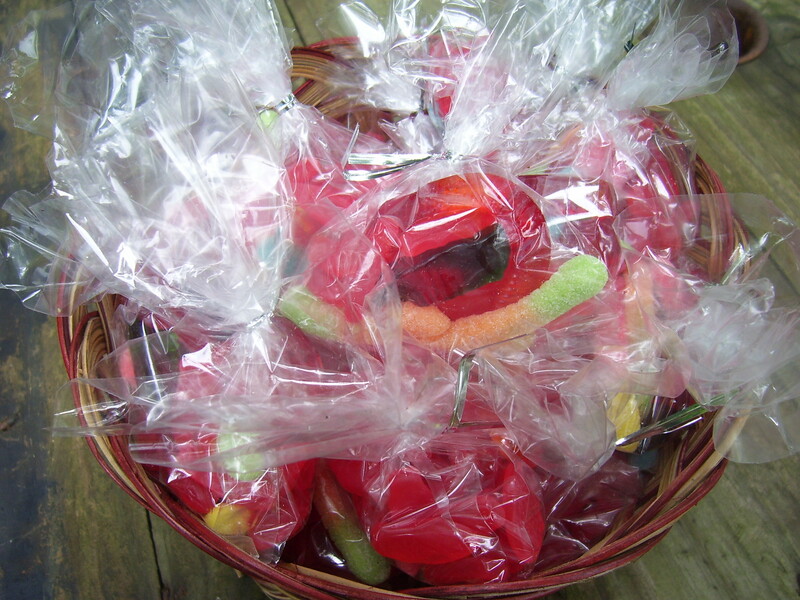 Not a great picture, but the party favors were baggies of gummy worms and Swedish fish. 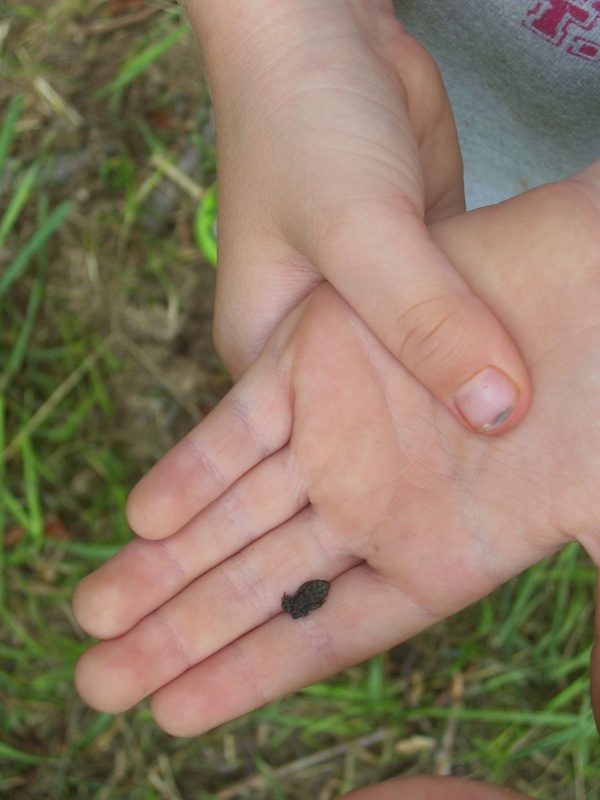 There were literally thousands of these tiny frogs hopping everywhere. If you didn’t look closely, one might think they were some kind of insect. My liitle guys kept picking them up and calling them their “babies.” I think several of the “babies” may not have survived their handlers! The only fish that got caught was a Swedish fish! We also had a short hike through the woods before dinnertime. All in all, I think the kids had a great time (the adults too). Taking the pressure off myself allowed me to just enjoy the party and being with my son and his friends. Not that it wasn’t any work or planning at all, but I didn’t expect everything to be just so. Therefore, next time you have to throw a kid bash, ease up on the details and you may find yourself (and perhaps your guests?) enjoying it more. I’m not sure when it starts, but all of my kids learn to associate banking with Dum-Dum lollipops. If I even mention the word “bank,” they immediately have concerns about whether or not they will be getting a lollipop and which flavor it will be. The girls who work at our bank (we pretty much always do drive-thru) always ask “how many do you have with you today?” and know to give all of the same flavor (less battles that way!). 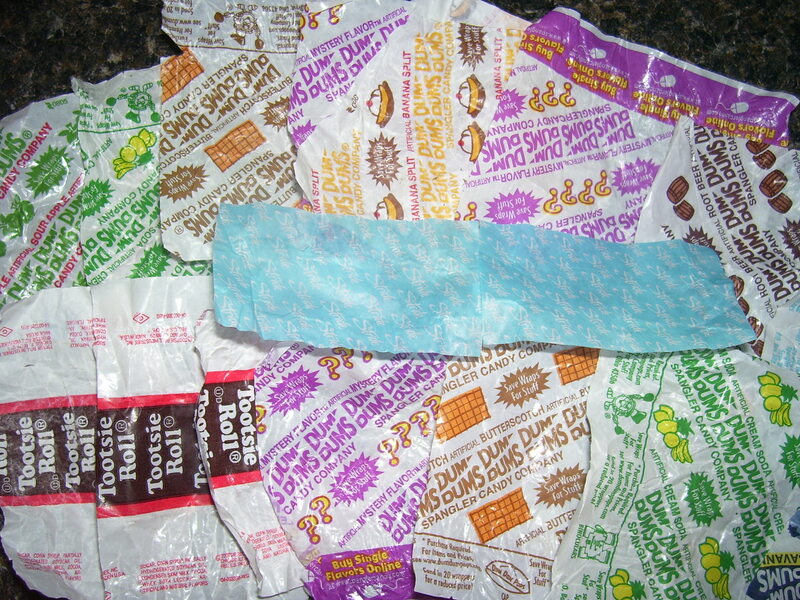 It is not unusual to find Dum-Dum wrappers strewn about the floor of my van, amongst many other various items. 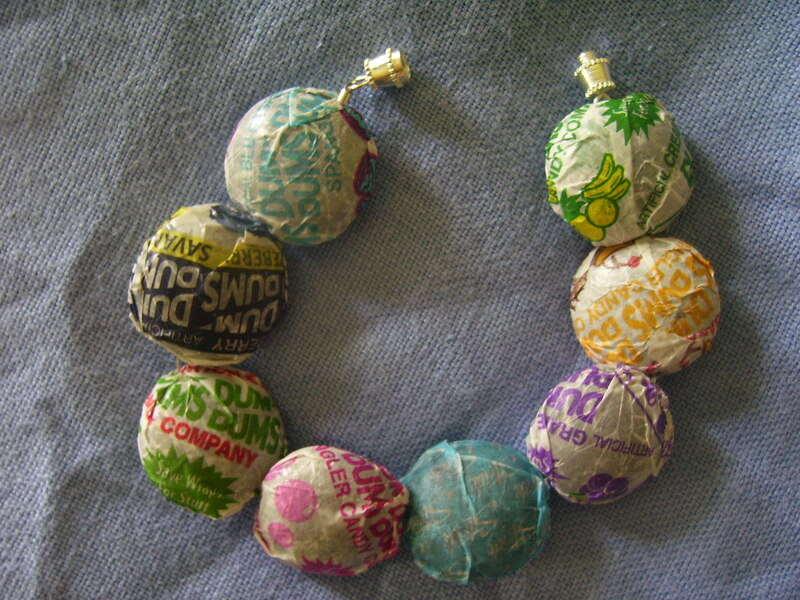 Awhile back I saw a post on dollarstorecrafts.com about using Dum-Dum or other candy wrappers and Mod Podge to make cute beads for kids. I of course at least had to give it a whirl, so we saved up our wrappers and today I had a block of time to try it out. I was pleased with the results and my little gal now has a cute new bracelet to flaunt. It was quite easy and took few materials: candy wrappers, Mod Podge, paintbrush, beads, beading wire or stretchy beading cord, bamboo skewer. Want directions? First things first–make sure your candy wrappers are clean and dry. Lay out the beads you will use and get your Mod Podge and paintbrush ready. Got a bunch of these lying around? 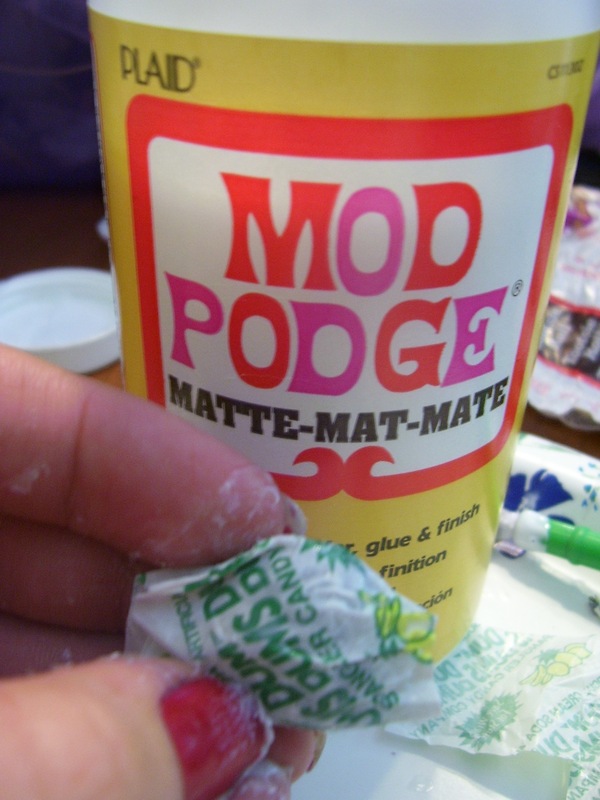 More Mod Podge can be painted on the outside to get it to adhere well and to help smooth it out. Use the pointy end of the bamboo skewer to reinforce the holes of the bead. Allow to dry and then string onto a stretchy cord or onto beading wire. I put mine on Accuflex wire and then used a barrel clasp as a closure. As you can see, I also used some gum wrappers, but I’m sure lots of candy wrappers would work for this project. Cute, huh? If you're either a Dum-Dum or Smartie at crafting, you can do this. This is a fun, fizzy treat to make on a hot summer’s day or a 4th of July picnic. My kids and I saw this in the most recent Taste of Home magazine and just had to try it. The problem was it takes Pop Rocks candy and I had the darndest time finding them. Finally I found some (at JoAnn Fabrics of all places!) and we had to make these that very night. Unlike some other desserts where my husband and I end up cleaning up the kids leftovers, not a drop was left when my crew was done with them. 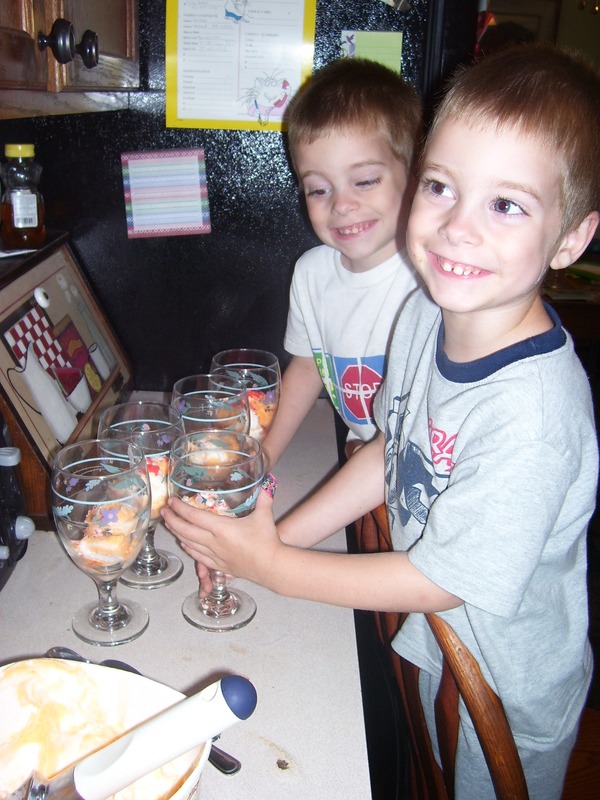 To make them extra special, serve in tall parfait glasses or something similar. Little helpers like to get in on the action. This recipe can’t be much easier. 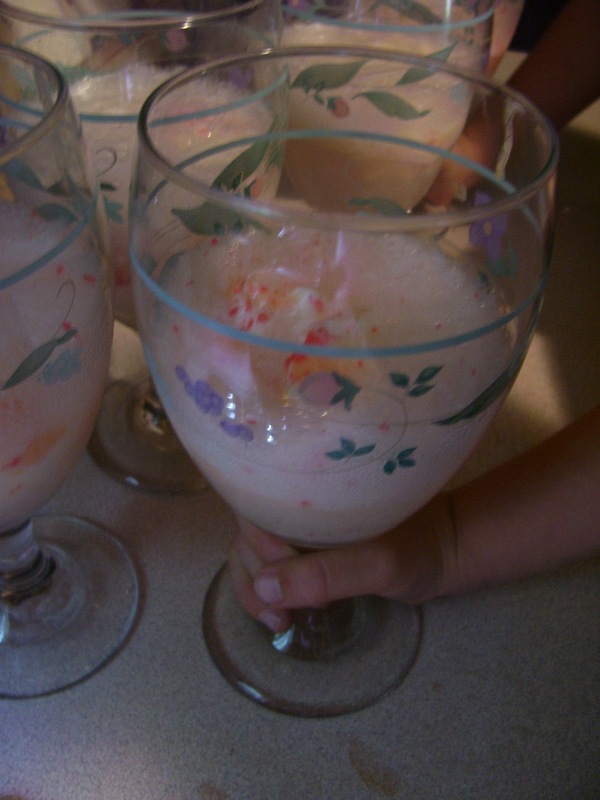 All you need is ice cream or sherbert (we used Turkey Hill Orange & Cream), Pop Rocks candy, and some kind of carbonated beverage. 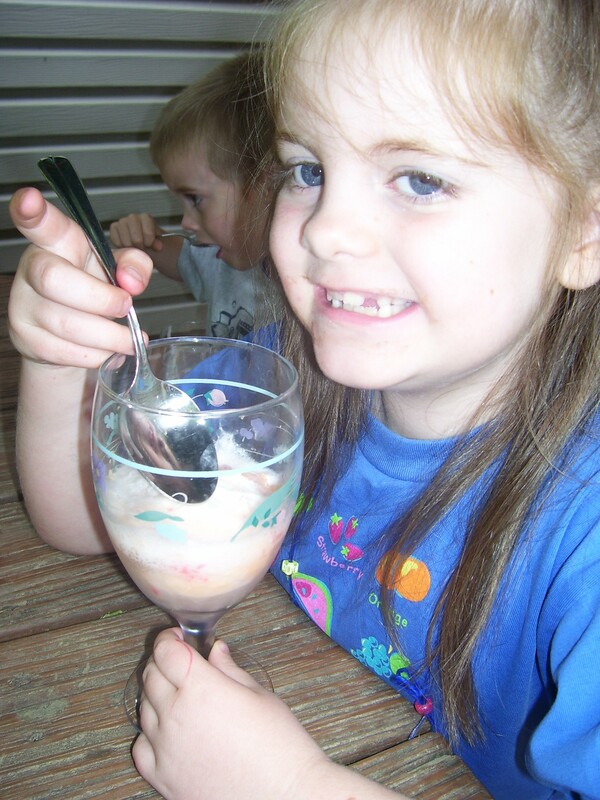 Layer ice cream on the bottom, drop some Pop Rocks on it, and then pour soda over top. Watch it bubble and fizz! Of course I had to make one for myself. I would describe it as a little party going on in your mouth. The fruity tasting ice cream made it especially good. We have made these a couple of times now and they have been devoured every time. Now Mama needs to go buy some more Pop Rocks! My oldest son is going to be 10 next week and he is loving anything S’mores right now. Daniel is such a sweet soul that he was very moved by the footage of the most recent tornados that have taken place in the US. He decided to make and sell some baked goodies and treats so that he could donate to that particular cause. In fact, we researched different S’mores-type recipes and this is one we ended up liking a whole lot. After they were made (and of course we HAD to sample a couple, just to be sure they were good 😉 ) he also requested that these be made in place of a traditional birthday cake for his party next week. 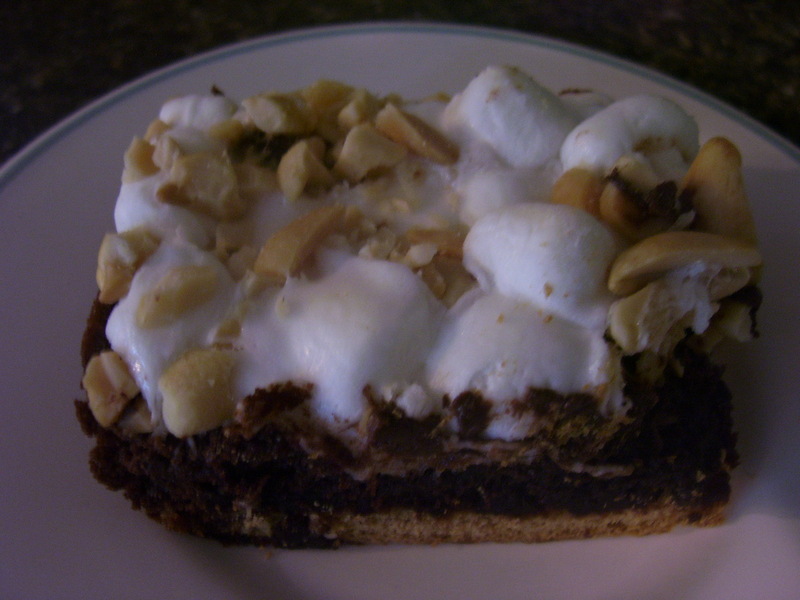 They are a S’mores Lover’s Dream–graham crackers, chocolate brownie, mini-marshmallows, peanuts, and chocolate chips. Mmm, Mmm, Mmmm…..
Preheat oven to 350. Grease a 9×13 pan and line bottom with graham crackers. Prepare the brownie mixture according to package directions and pour over crackers. Bake for 25-30 minutes, or until completely baked. Sprinkle top with marshmallows, chocolate chips, and peanuts. Bake @5 minutes longer or until marshmallows are puffed and getting a golden brown color. Cool before cutting! I am a complete sucker for quick and easy recipes that use a minimal of ingredients and don’t have a million steps. 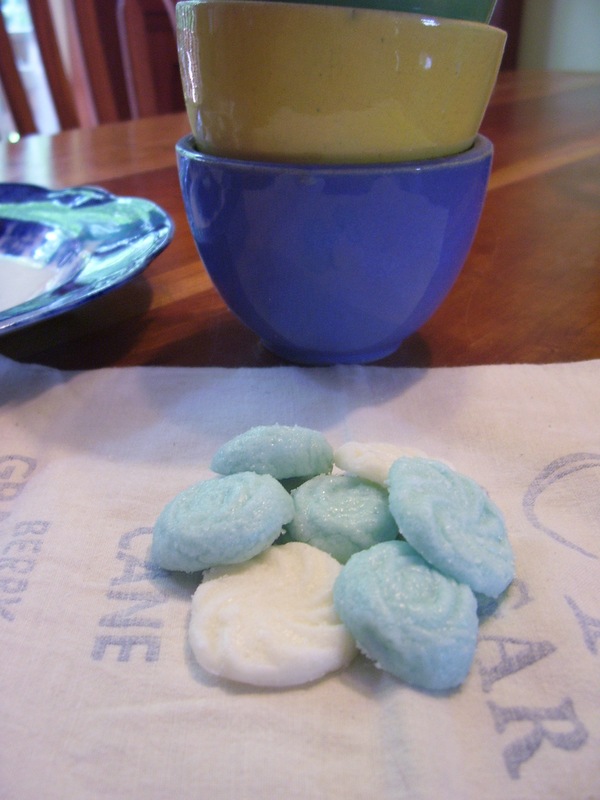 My recipe for butter mints is exactly that. About 12 years ago, when I was preparing for my wedding and reception, my mother-in-law offered to make these for the reception tables. They were a huge hit and since then I’ve made these for various occasions. Whether you are hosting a graduation party, cookout or are planning a baby shower, bridal shower, or wedding, these are a sure crowd pleaser. Don’t let the name fool you–there is actually no butter in these mints! However, they are sweet, minty, and melt-in-your-mouth delicious. Set cream cheese out to soften, or microwave in short increments until it is very soft. Place in a large mixing bowl and add entire 2 lb. bag of 10x sugar. Mix by hand until dough is uniform. Add in several drops of mint oil or mint extract to taste. Add in several drops of food coloring, if desired. Mix mint and coloring in well by hand. Form into small balls and roll in granulated sugar. You can either flatten with a fork or use a small push-mold to make shapes. Place on wax paper. Store in an air-tight container in the refrigerator until serving. Enjoy! **Mint oil is highly concentrated and only takes several drops. Mint extract is not as concentrated and may take more to ensure minty flavor.